Airport, from where about 20-minutes-drive took us to Ohio State University. 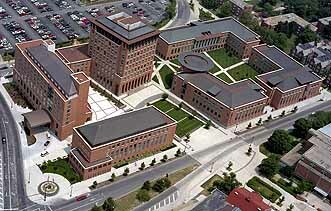 located at the northern entrance of The Ohio State University’s main campus. satellite uplink capabilities, video-on-demand, and nearly 3000 computer ports. funded hotel, the Blackwell Inn, where we stayed during the conference. service companies listed in Japan. and advices for data processing. tough and enjoy making presentations. am deeply grateful to Professor Kijima for his help and kindness.